Mark Cavendish went into today's stage being the first sprinter (or cyclist) to win four times on the Champs Elysees and had ever reason to think today would make it the fifth win in a row. But the Tour carried four different fast men to the boulevard of Paris, four men each with a powerful lead out and the speed, strength and nerve to be the first to cross the line. Cavendish may have been hampered by having to chase back on to the peloton after a flat earlier on the cobbles, he may have used to much energy in the chase to have that famous final kick to the line. In the end it was the new sprinter of Argos-Shimano, Marcel Kittel that grabbed the win, making it four stages for him in the 100th Tour de France. This is an original watercolor and ink postcard that can be yours by visiting my artist website where you can purchase this painting. Just follow the direct link at the end of this post to get your piece of the final sprint of the 100th Tour de France. This project has been a joy, a challenge and an artistic voyage and I thank you for taking the trip around France (and Corsica) with me. Swinging out of the tunnel under the Place du Concorde and around the "Norwegian Corner" the sprinter's lead out men are at full bore as they race under the final Flame Rouge of the 100th Tour de France. The red kite denotes just one kilometer left to the finishing line and it is time for the fast men to have their lead out men at full speed if they want to be first across the line. 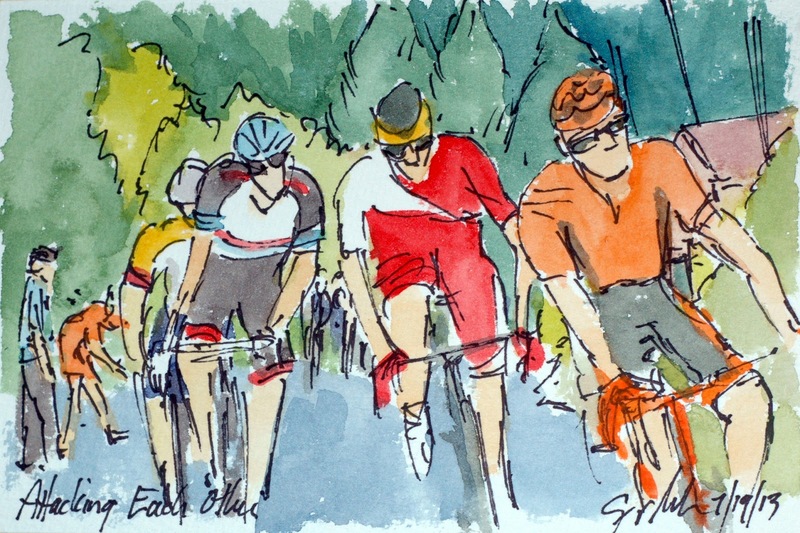 This Tour has had wonderful sprints with four fast men competing for stage victories. 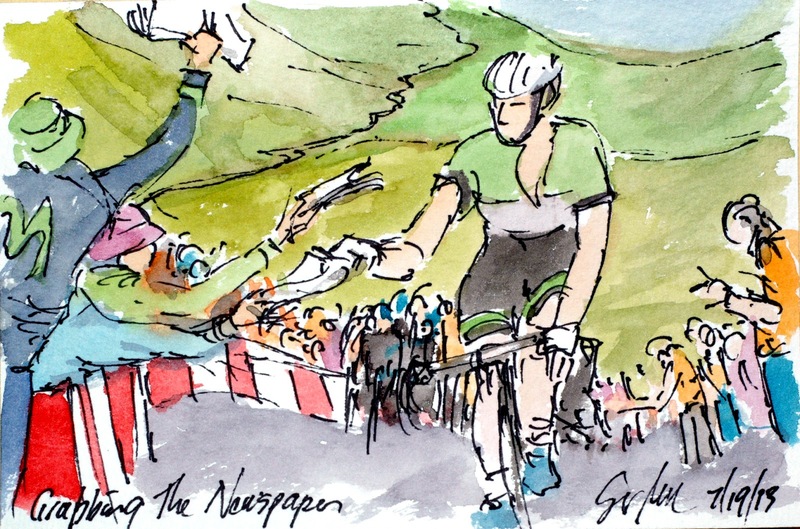 Peter Sagan easily won the Green Jersey of most consistent sprinter, but only manage a single stage victory on a small mountain stage. But then the Malliot Vert is for consistency and he was second and third more than any single sprinter won stages. Today he didn't even make the top three in the mad dash for the line. This is an original watercolor and ink postcard that can be yours by visiting my artist web site where you can purchase this painting. While you are there, why not browse around at all of the art that is on offer. 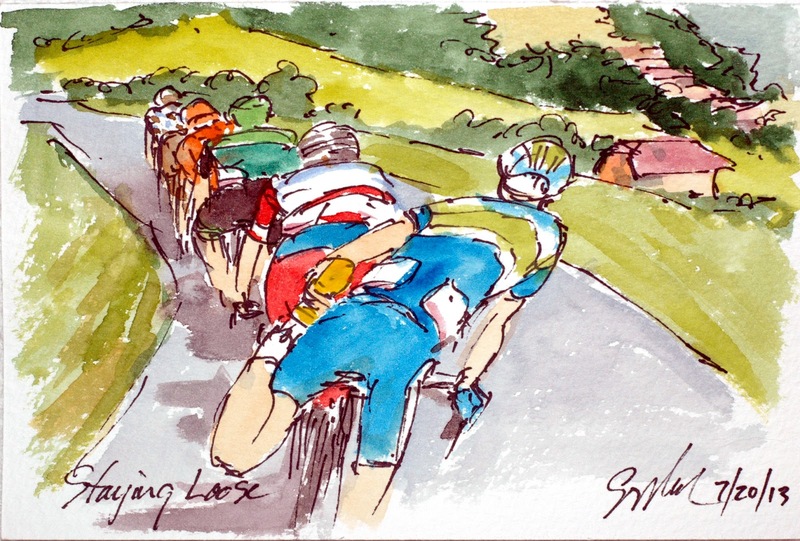 Just follow the direct link at the end of this post to get your piece of the final kilometer of the final stage of the 100th Tour de France. 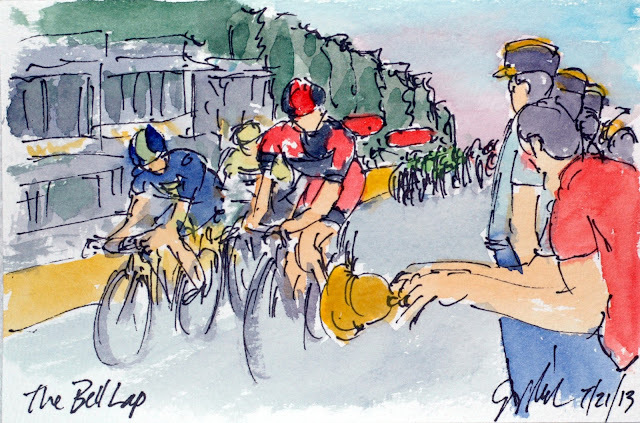 The three men in the breakaway, including surprisingly Alejandro Valverde, are looking over to see the ringing of the bell that signals the start of the final lap of the Champs Elysees and the 100th Tour de France. The bell lap is used in every circuit race from the small club races that I rode as a teenager to the big tours like the Giro, the Tour de France and the Veulta de Espana. The Gendarme of France look on as the peloton closes in on the three in front of the press and VIP viewing boxes. This is an original watercolor and ink postcard that could be yours by visiting my artist website. Just follow the direct link at the end of this post to get your piece of the final stage of the 100th Tour de France. With just two laps to go and the break within seconds ahead, the sprinter's teams started to get themselves organized. They, too, were trying to ride the gutter, the constant shaking and jarring of the cobbles had to be getting to everyone's arms, legs and butts. So far it is Omega Pharma Quickstep on the front for Mark Cavendish with a bit of Argos-Shimano mixed in for their man Marcel Kittel. With the kinds of speeds the trains were turning over, the small break was sure to be caught well within the final kilometer. This is an original watercolor and ink postcard that could be yours by visiting my artist website where you can purchase this painting. 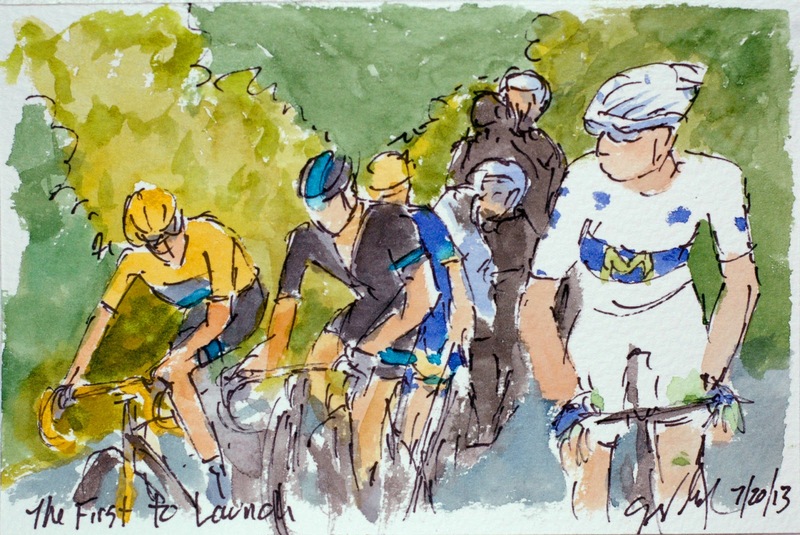 Just follow the direct link at the end of this post to get your piece of the final stage of the 100th Tour de France. While his mechanic change the rear wheel with the upmost of speed and the French Champion took the opportunity to stretch out his back before jumping back on for the chase back. He made quick work of it on the descent down the other side of the boulevard only to flat again. 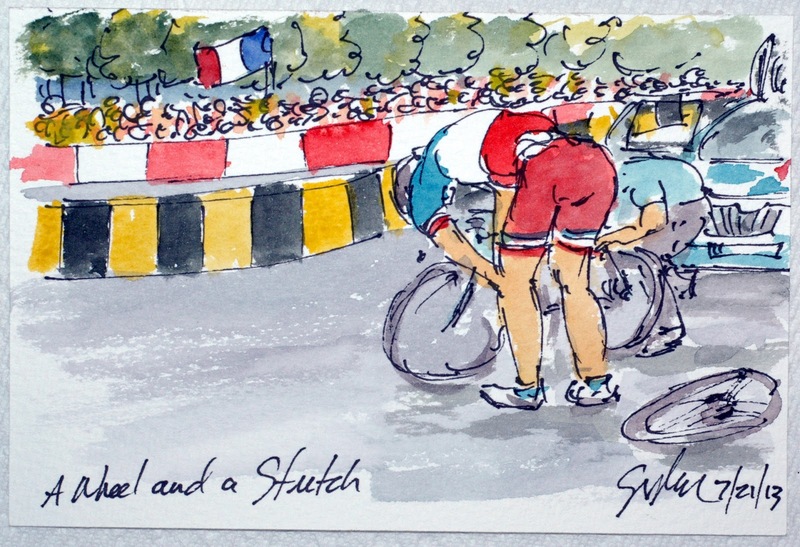 Some days are just that way, although he did make it back on again to finish the Tour in the peloton. This is an original watercolor and ink postcard that can be yours by visiting my artist website where you can purchase this painting. 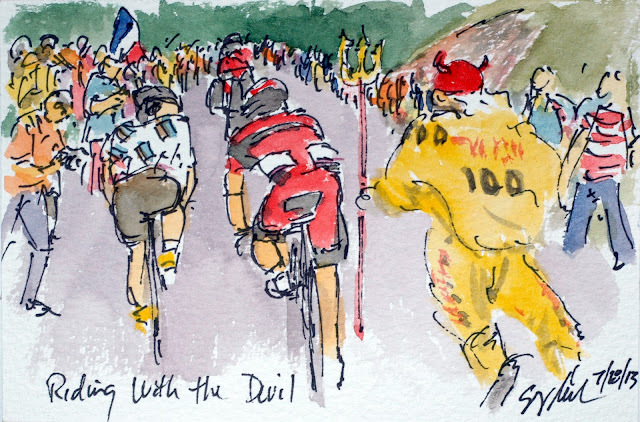 Just follow the direct link at the end of this post to get your piece of the final day of the 100th Tour de France. 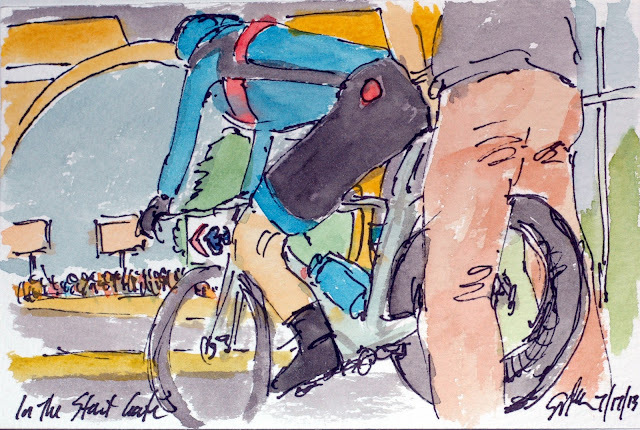 With the sprinters and their teams ramping up the pace and the exhaustion of twenty one days of full on racing some of those at the back began to have trouble holding on to the tail of the peloton. Or it could be that they just wanted to savor the spectacular view of the Arc at the top of the rise lined with French flags a carefully trimmed trees. The green banner first marks the sprint point of the day which will then change out to the final finishing line of the 100th Tour de France. This is an original watercolor and ink postcard that can be yours by visiting my artist website. Just follow the direct link at the end of this post to get your piece of the 100th Tour de France. The Tour organizers pulled out all of the stops for the 100th Tour de France's finish on the Champs Elysees including having the peloton circumnavigate the L'Arc du Triomphe ten times on their way to the finishing line. This change made for a faster finale since the riders didn't have to make the sharp U-turn two thirds of the way up the cobbled boulevard, but could stay at full speed like they do when turning around on the Place du Concorde. Plus it sure made for a stunning backdrop for the speeding peloton. This is an original watercolor and ink postcard and is available for purchase at my artist website. Just follow the direct link at the end of this post to get your piece of the historic final stage of the 100th Tour de France. It should come as no surprise that there was a break away on the cobbles of the Champs Elysees and that one of the attackers was Juan Antonio Flecha. He was joined by the Brit, David Miller, who hoped against hope to surprise the sprinters and claim the victory on the boulevard of Paris. It was probably a fool's errand with four marquee sprinters all with strong, fast lead out trains ready to bring their man to the finishing line first. They are riding along the gutter to avoid the rough cobbles of the boulevard of Paris. Hoping that the granite curb stones are smooth brings a risk of flats and clipping a pedal against the curb. This is an original watercolor and ink postcard that can be yours byvisiting my artist website where you can purchase this painting. 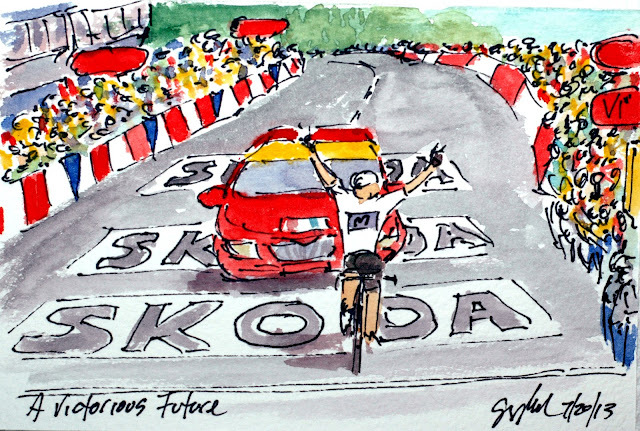 Just follow the direct link at the end of this post to get your piece of the final stage of the 100th Tour de France. Another of the final day traditions is for the team holding the Malliot Jaune to lead the peloton onto the Champs Elysees and around the finishing circuit in a victory lap of honor. Once this has been completed, it is now time to start racing, and to quote Phil Liggett, "They throw off the sand bags..." and get down to it. You may be able to tell that the teams of the sprinters are right behind Team Sky ready to bring their fast men first across the finishing line. This is an original watercolor and ink postcard that is available for purchase at my artist website. Just follow the direct link at the end of this post to get your piece of the final day of the 100th Tour de France. 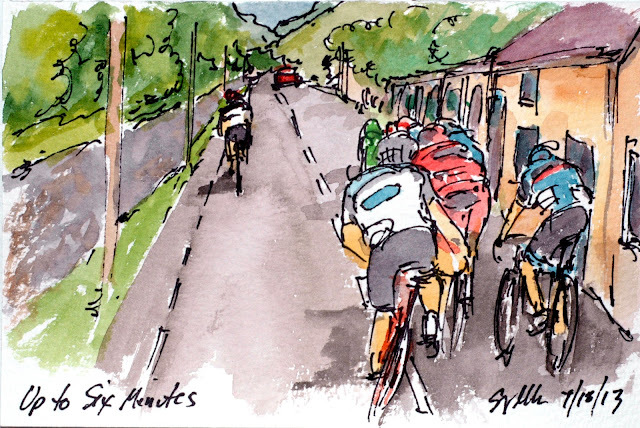 Chris Froome and the whole of Team Sky could finally relax on their ride into Paris, all that had to be done is get to the three kilometers to go marker, then he will have won the 100th Tour de France. Riders always trick out their bikes to reflect their leaders jersey, Froome is riding a bright yellow bike, but this is the first time I have seen a team car get a new paint job, changing all of the bright blue accents to yellow. Froome and his Director Sportif clinked glasses in a toast to the team's success and the second British Tour de France victory in as many years. This is an original watercolor and ink postcard that is available for purchase at my artist website. Just follow the direct link at the end of this post to get your piece of the 100th Tour de France. The final day's ride towards Paris is filled with traditions, so during the promenade phase of the stage, the Malliot Jaune will take a celebratory glass of champagne usually shared around with the team both those on and off the bikes. 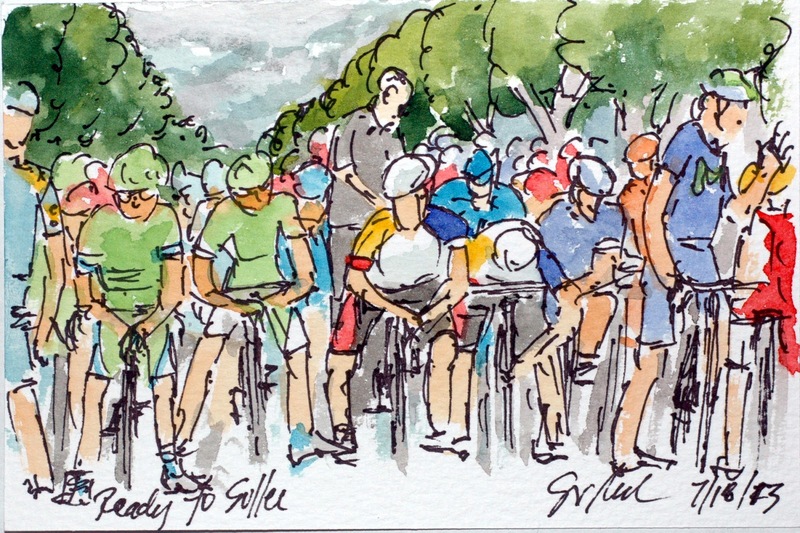 Like every thing else that happens on the roads of the Tour, this, too, is done under the gaze of the hundreds of thousands of fans that will line every kilometer of every stage of the Tour. Chapeau to Team Sky and Chris Froome! This is an original watercolor and ink postcard that can be yours by visiting my artist website where you can buy this painting. Just follow the direct link at the end of this post to get your piece of the 100th Tour de France. The Tour rolled out from the grounds of the Palace of Versailles twisting it way towards Paris at the pace of a promenade. 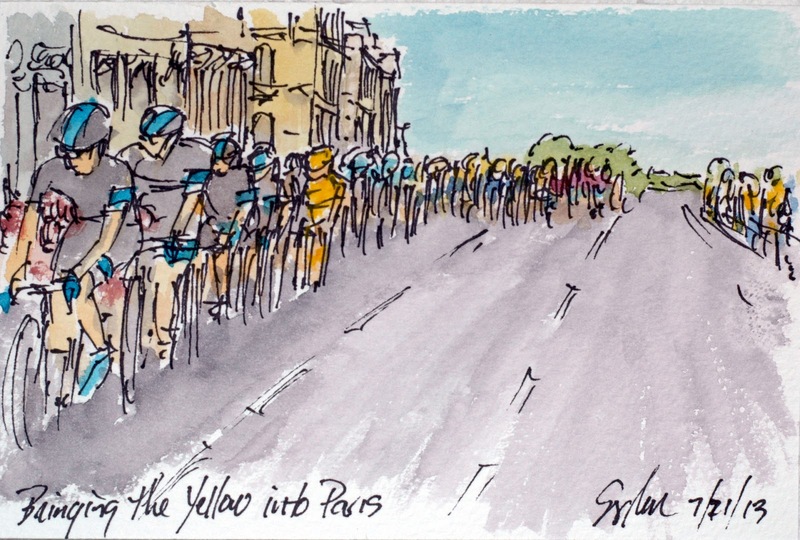 With the Yellow Jersey firmly decided as well as the rest of the jerseys, the peloton honored the long standing tradition of no one attacking the GC or jersey positions on the ride into the City of Lights. The route organizers tossed in two small hills but there weren't enough points to change the destiny of the Polka Dot Jersey and the climbs were just gotten over. Niki Terpstra was out on the front, practicing for the lead out that will be required on the Champs Elysees in a couple of hours time. This is an original watercolor and ink postcard and like all of the works in this series of the 100th Tour de France, was painted using cake watercolor, brushes and paper from the www.richesonart.com This painting is available for purchase at my artist website, just follow the direct link at the end of this post to get your piece of the final day of the 100th Tour de France. The 100th edition of the Tour de France was highly populated with young exciting, strong riders from around the world. This young Colombian, Nairo Quintana, at the age of 23 shows that the future of cycling is in great hands. He has been fighting on every mountain stage of the Tour, sometimes going too soon and sometimes not using the best strategies, but today, it all came right. His team had ridden hard on the front of the peloton for hours, then his teammate Valverde attacked the group dispatching everyone but Porte, Froome, Contrador and Rodriquez. 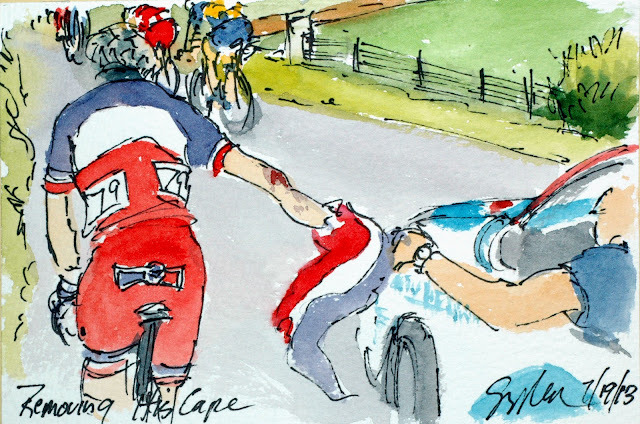 After an attack by the Katusha rider, some counters by Froome, Quintana attacked as soon as he caught back up to Froome. He counted on Froome not being able to respond having just tried a hard push into his red zone. Having got a gap on the others, he was off to his first stage victory in his first Tour de France. He will ride into Paris having one a stage, the White Jersey and the Polka Dot Jersey all in his first visit to the Tour and at the young, young age of 23! This is an original watercolor and ink postcard that is available for sale at my artist website. 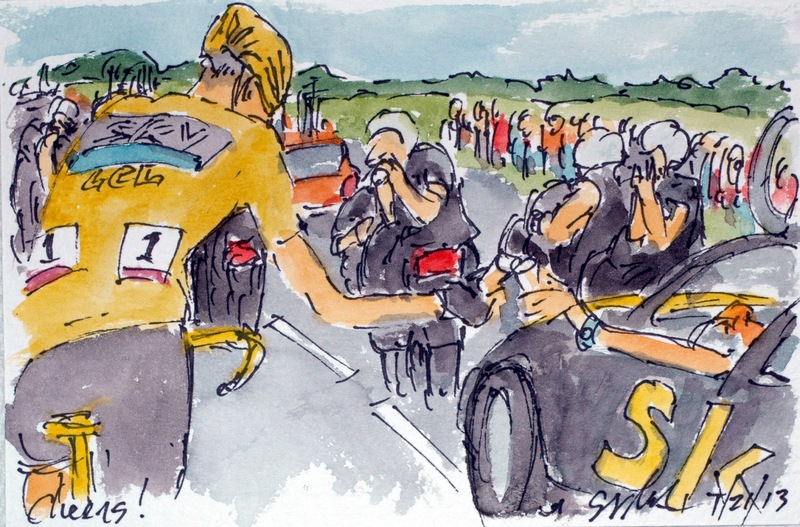 Just follow the direct link to get your piece of the 100th Tour de France. First Rodriquez went, and Quintana and Froome chased him back. Then Froome went, twice, and Quintana and Rodriquez chased him back, but on the second return, Quintana jumped them both. 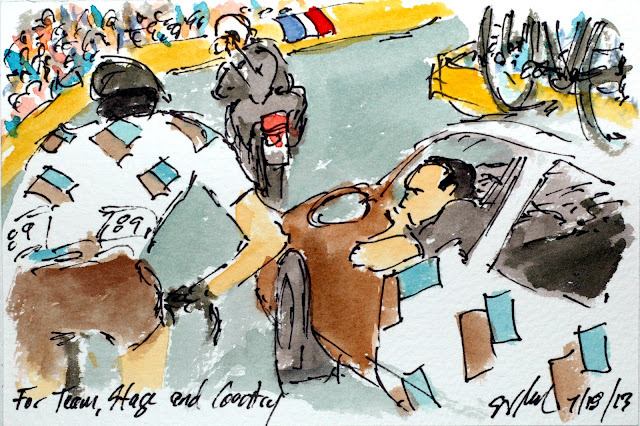 After their attacks neither Rodriquez had the answer for the Colombian, and when Rodriquez actually went after Quintana, Froome lost the Spaniard's wheel. But here they are the three top GC men of the 100th Tour de France on top of the final Alpine climb in this running of the Tour. Whoever gets over the line first will be able to claim the Polka Dot Jersey for the best climber in the 100th Tour de France. This is an original watercolor and ink postcard that can be yours by visiting my artist website where you can purchase this painting. Just follow the direct link at the end of this post to get your piece of the 100th Tour de France. 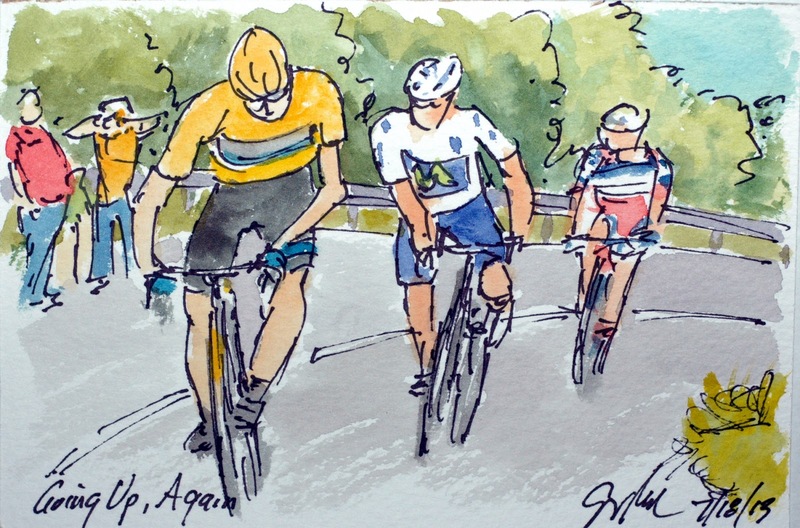 With GC placement on the line, Froome having sewn up the Yellow Jersey for 2013, the top five were fighting it out with each other to gain time to be on the podium in Paris. 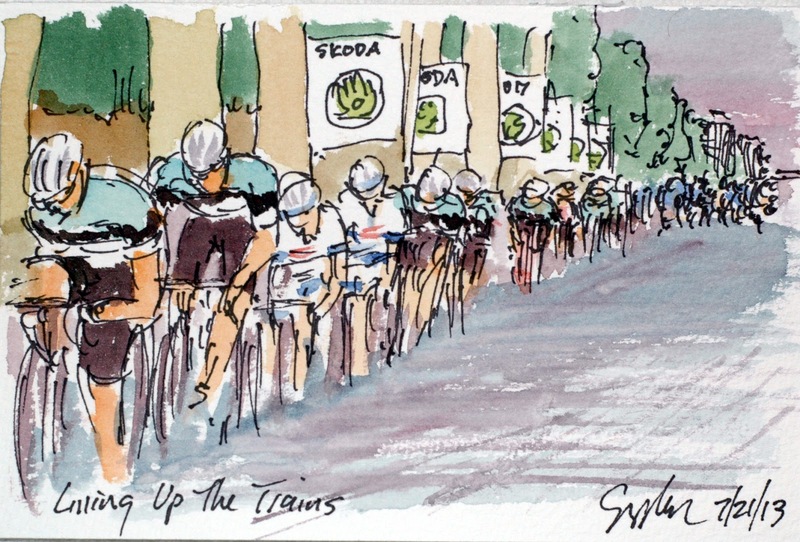 The TV commentators and I thought this was it, the big move by Quintana attacking Contrador and the Sky boys. 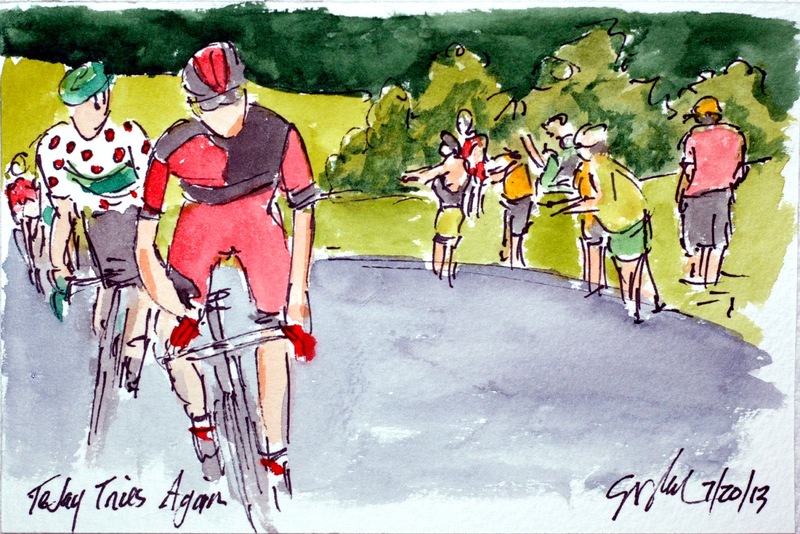 After I painted this image, the TV Moto pulled out to reveal that is was Joaquim Rodriquez was the one to launch the first attack and Quintana is covering that attack. Quintana started the day in 3rd looking for 11 seconds to overtake Contrador, and Rodriquez looking for 47 seconds to accomplish the same feet. Chris Froome had over 5 minutes in hand, so he could just watch the proceedings, however, you don't have the strength and drive to pull on a Malliot Jaune and then watch your rivals ride away from you on the final mountain top finish of the 100th Tour de France. This is an original watercolor and ink postcard that is available for purchase at my artist website. Just follow the direct link at the end of this post to get your piece of the 100th Tour de France. 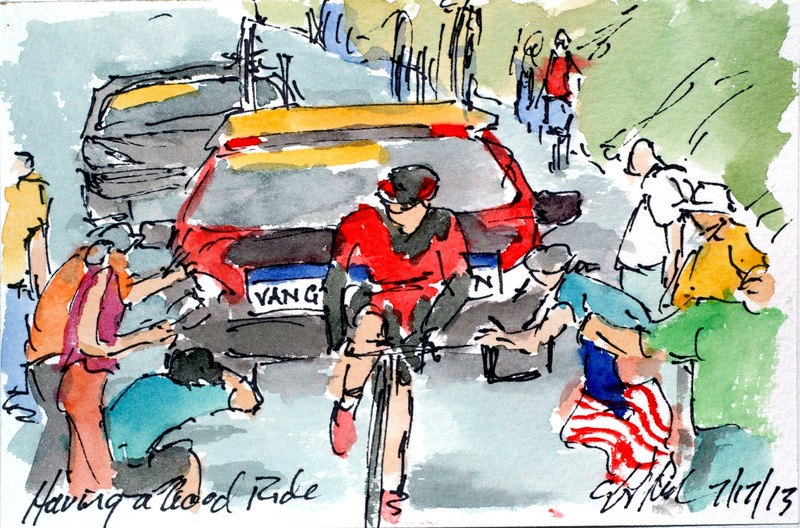 For the third day in the Alps, TeJay Van Garderen must be feeling good, because he was out of the peloton and off in search of a mountain top victory. 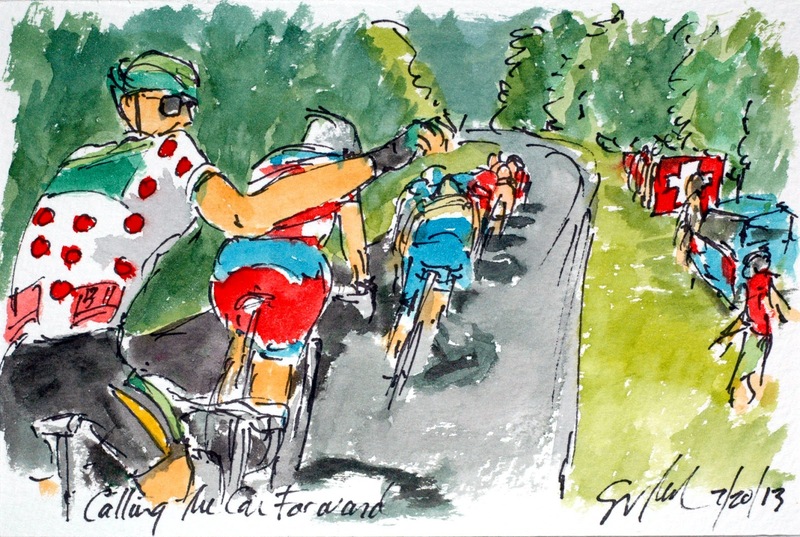 Pierre Rolland is desperately trying to hold the wheel of the charging American in hopes of shoring up his lead in the Polka Dot Jersey. If TeJay had felt like this in the Pyrenees. BMC may well be having a very different Tour de France. As it is, he is doing a great job flying the colors of Team BMC. This is an original watercolor and ink postcard that could be yours by visiting my artist website where you can purchase this painting. Just follow the direct link at the end of this post to get your piece of the 100th Tour de France. Listening to Phil Liggett and Paul Sherwen talk about Jens Voigt is so fun and amazing. They have been talking about winning solo breakaways by Voigt in the Tour in 1998, they credit someone with calling him the "Peter Pan of the Peloton", and they are obviously very impressed with this veteran of the Tour. Today, he was off in search of another victory to add to his palmers. He was able to hold off the competitive peloton and his aggrieved break away companions over the penultimate alpine climb of the 100th Tour de France. 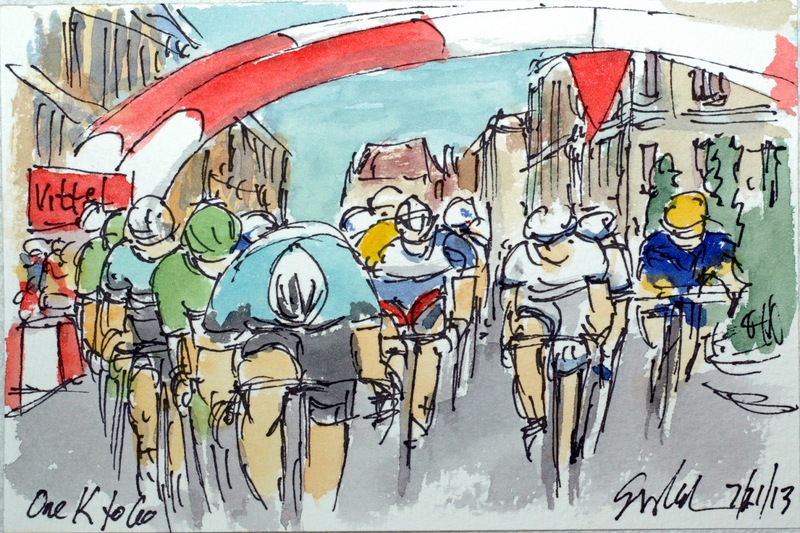 It was a great spectacle to watch and to paint. This is an original watercolor and ink postcard that is available in a short 3 day auction on ebay. Just follow the direct link at the end of this post to get your piece of the 100th Tour de France. Sprinters are not known for their climbing abilities so in these hard mountain stages that will gather together and ride the climbs at their own pace. They are joined by the team helpers who have blown after doing what they can for their leaders, the riding wounded, and those having a bad day for one reason or another. The Tour has a time limit based on a percentage of the winner's finishing time if a rider can't make that limit, they are out of the Tour. One way (other than making the time cut) to avoid being ousted is to form a big enough group that the officials will not want to disqualify that many riders. 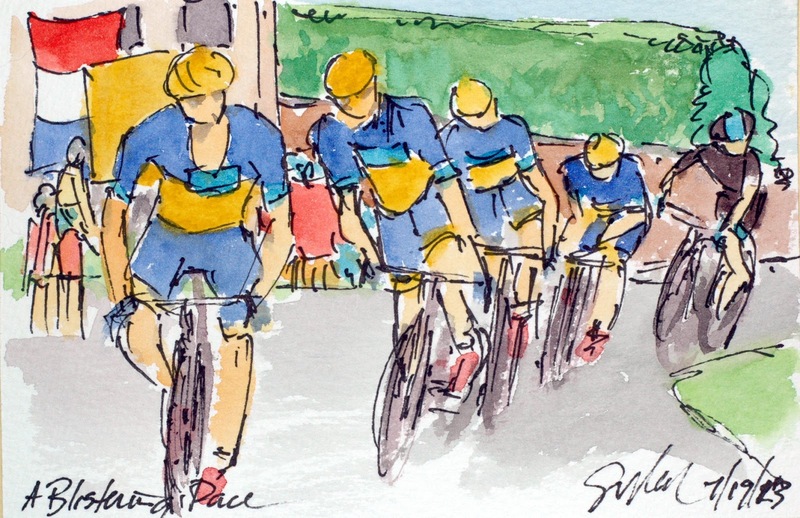 Back when Lance Armstrong was racing the Tour, a big break away got so far up the road that the entire peloton should have been out, but two more weeks of a tour with only twenty riders just wasn't thinkable. 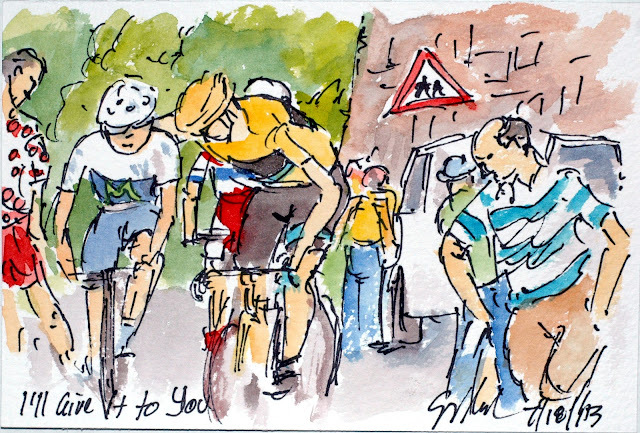 This is an original watercolor and ink postcard that is available for purchase at my artist website, just follow the direct link at the end of this post to get your piece of the 100th Tour de France. Rolland may have taken the "Most Combative" award a little too far on the third climb of the day. Anton is a teammate of Nieve, who is just behind Rolland in KOM points and is trying to nip the points away from Rolland as a defensive move. Rolland wasn't having any of it and swerved off of the wheel of his teammate and blocked Anton's sprint for the summit. I don't know if he was relegated for this blatant violation of sprinting rules, but the end of the day's events made this action a mute deed in the end. This is an original watercolor and ink postcard that could be yours by visiting my artist website where you can purchase this painting. Why you are there, why not browse around at all of the art on offer? Just follow the direct link at the end of this post to get your piece of the story of the 100th Tour de France. The two break away groups had joined together on the second climb on the road with Rolland getting second on the second climb putting him into the KOM lead on the road. After summiting Pierre called forward his team car for drinks, something to eat and a little information. He needs to stay topped up with fuel to keep getting over the ensuing mountains first and to stay ahead of the main group that contains all of the other KOM contenders. This is an original watercolor and ink postcard that can be yours by visiting my artist website where you can purchase this painting. While you are there, why not browse around all of the art that is on offer? 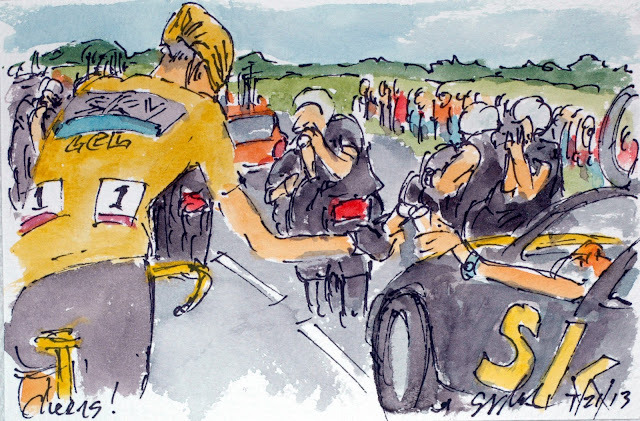 Just follow the direct link to get your piece of the 100th Tour de France. These are the second group up the road just dropping off the first climb of the day, Simon Clarke is just now on the back stretching out his legs for the hard day of climbing ahead. 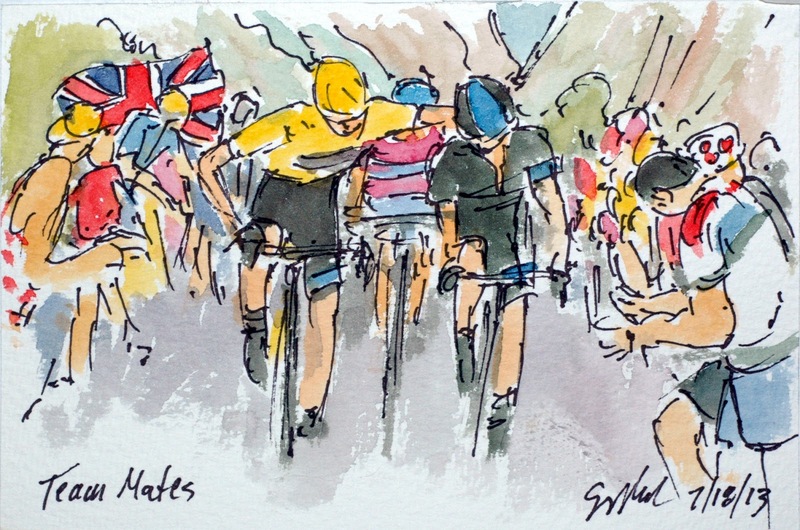 Fortunately for all involved, it is the last day in the Alps, and the penultimate day of the 100th Tour de France. This group is about two minutes behind the first four and maybe four ahead of the group with the Yellow Jersey. This is an original watercolor and ink postcard that is available for purchase at my artist website. Just follow the direct link at the end of this post to get your piece of the 100th Tour de France. At the start of the day Pierre Rolland was in third place for the King of the Mountains Jersey even though he had it on his back for today's stage. " Why? ", I hear you asking, the two ahead of him are Chris Froome, who is busy wearing Yellow and Nairo Quintana currently bedecked in White. Since you really can't wear to jersey at once, the Polka Dot Jersey feel to Rolland who, again, was riding in third place on points. Having worn the Jersey earlier in the Tour, he said out today to make it rightfully his, escorted by Jens Voigt, Burghardt and Flecha in the first break up the road. 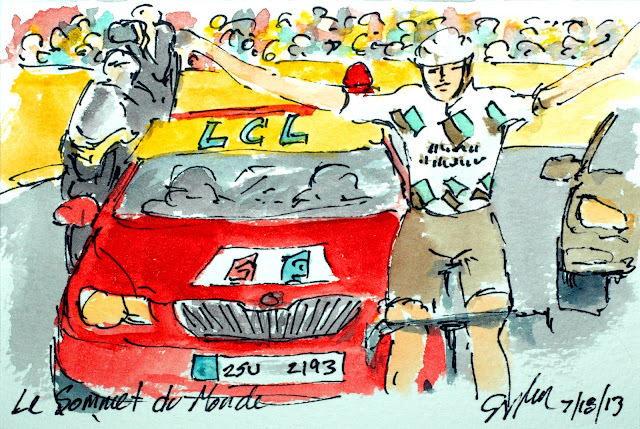 His number is printed on a red field as the most combative rider from the previous stage. 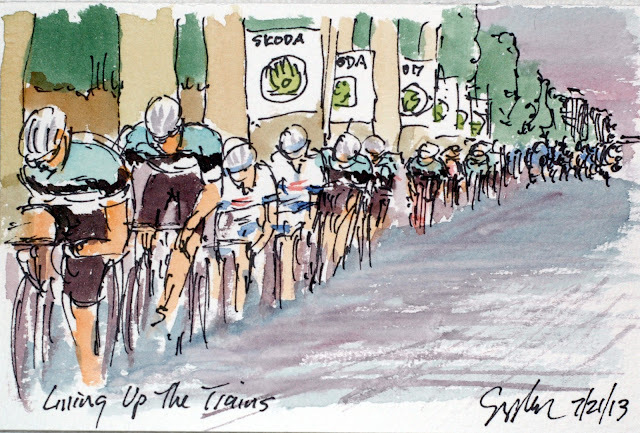 This is an original watercolor and ink postcard that has been created using cake watercolors, brushes and paper from www.richesonart.com In addition, this painting is available for purchase at my artist website, just follow the direct link at the end of this post to get your piece of the 100th Tour de France. 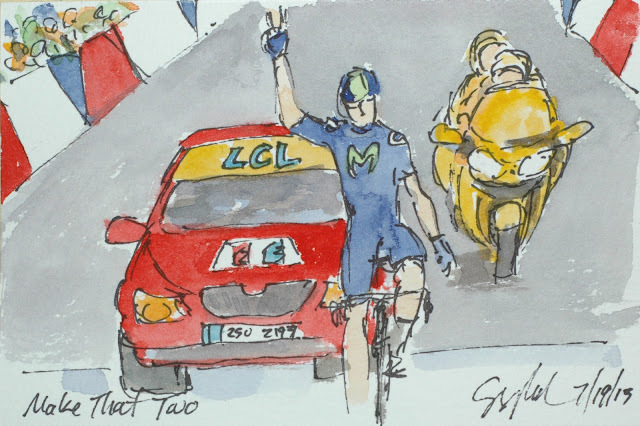 Rui Costa showed that he knows when to attack on a final climb. He has now taken his second stage win in the 100th Tour de France in the exact same manner. Today and on the road into Gap on the first Alpine stage, he attacked the fellow break away riders about half way up the climb and then stormed down the other side into town all alone. They must be dancing in the streets in Portugal, but then I think that is a regular pastime in Lisbon. This is an original watercolor and ink postcard that is available for purchase at my artist website. Just follow the direct link at the end of this post to get your piece of the 100th Tour de France. 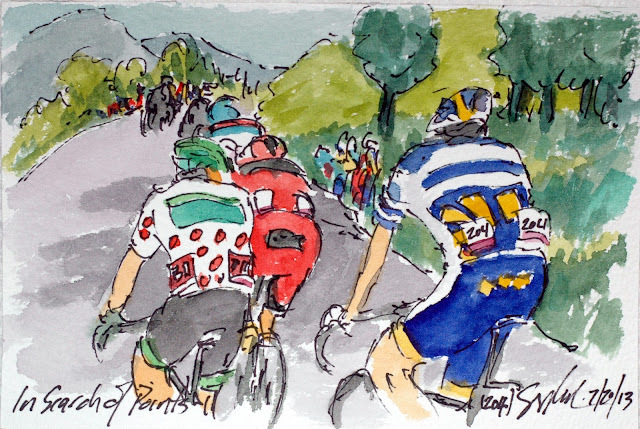 First Valverde and Bardet went up the road, a few minutes later, Rodriquez attacked. Once Rodriquez had gone, anyone in the upper ranks of the GC had to give chase, they are less than a minute apart from each other. Froome, on the other hand, has five minutes on the lot of them, but still he jumps and chases all of them down. Even more amazing than Froome answering the attacks is Richie Porte. Yet again he is dropped when the attacks start and quickly drops off the back of the group, and yet again, he digs deep and comes back up to his team leader. And not only does he come back up, but goes straight to the front and paces Froome to insure that they don't surrender a single second to the others. This is an original watercolor and ink postcard that can be yours by visiting my artist website where you can purchase this little painting. Just follow the direct link at the end of this post to get your piece of the 100th Tour de France. With about 15 kilometers left to go in the stage the skies opened up and dumped hard cold rain on the break away and the peloton alike. 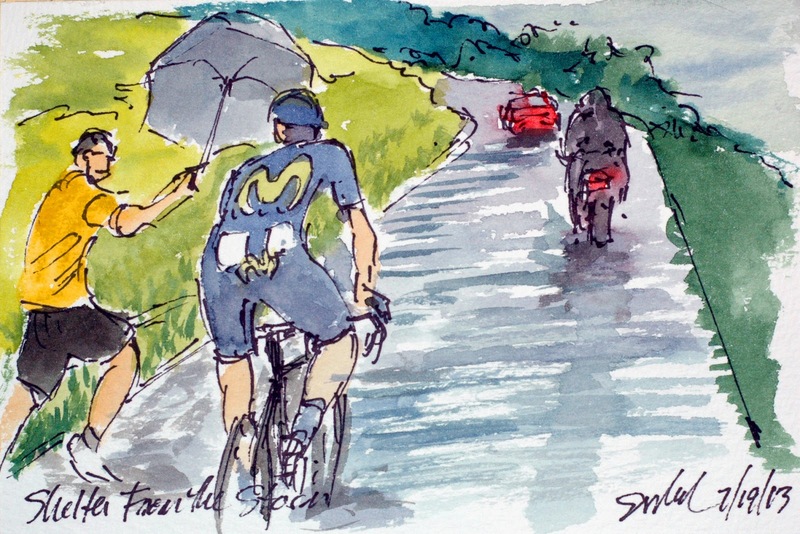 I don't know if the cycling fan was channeling Bob Dylan, trying to keep Rui Costa dry, or just running along side with an umbrella that just happened to be in his hand. The storm had turned the street into a small stream, but unlike baseball, the race must go on to the end. This is an original watercolor and ink postcard that can be yours by visiting my artist website where you can purchase this painting. Just follow the direct link at the end of this post to get your piece of the 100th Tour de France. Once the large break got to the bottom of the final climb, they knew the peloton wasn't coming back to them. With that kernel of knowledge it was time to get rid of the passengers and try to ride away from everyone else. Nieve is swinging from one side of the road to the other trying to shake the three that have come with him on the opening salvo. Bakelants, Navarro were stuck to him having no intention of letting him run away with the stage. This is an original watercolor and ink postcard that is available for purchase at my artist website. 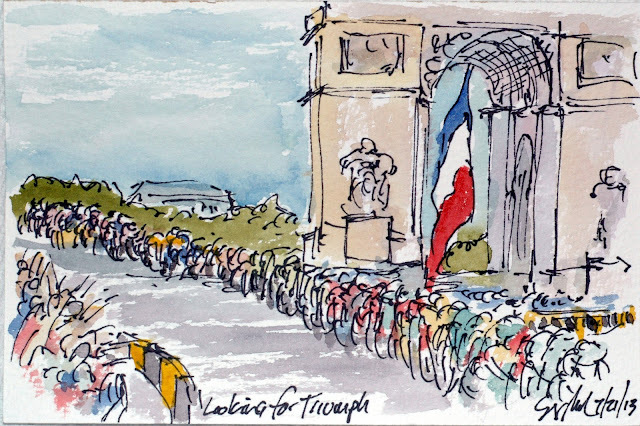 Just follow the direct link at the end of this post to get your piece of the 100th Tour de France. 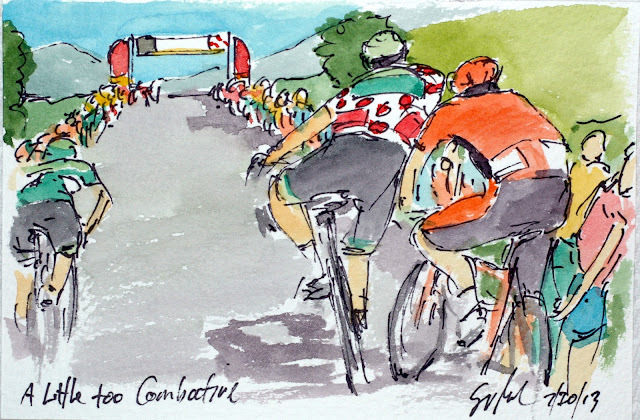 With the race for the Polka Dot Jersey and the stage win going on 10 minutes up the road, there was another battle for GC positions going on in the Malliot Jaune Group. Saxo Tinkoff, the team of second and third overall (Contrador and Kreuziger) went to the front to lift the pace and see who they could put into difficulty. While Froome has a very solid lead for the overall, there is currently only 45 seconds separating second place from fifth place and easy amount to overcome on a mountain stage. This is an original watercolor and ink postcard that can be yours by visiting my artist website where you can buy this painting. 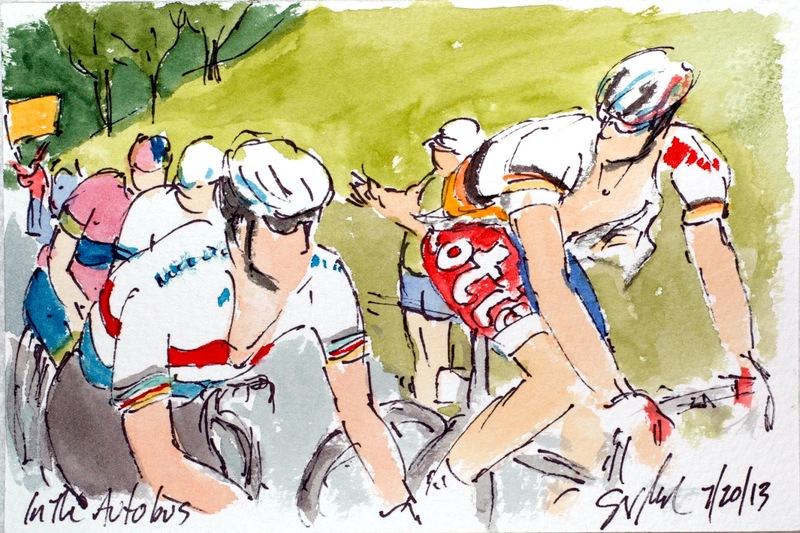 Just follow the direct link at the end of this post to get your piece of art of the 100th Tour de France. Arthur Vichot, the Road Champion of France, had a rough descent down the Col du Madeleine, going head over heals into a ditch. Fortunately he went off the road on the uphill side rather than going over the edge of the mountain. He was more stunned and upset than he was hurt, all though he left some of his French skin on the roads of France. Once he was down in the valley he passed his dirty, wet, torn tricolored vest to his team car and got on with the business at hand. This is an original watercolor and ink postcard that is available for purchase at my artist website. Just follow the direct link at the end of this post to get your piece of the 100th Tour de France. Ryder dropped Izaguirre on the next climb, but then was caught by Pierre Rolland. Rolland has worn the Polka Dot Jersey of best climber earlier in this Tour, but it seems that he was out to pull it back on. 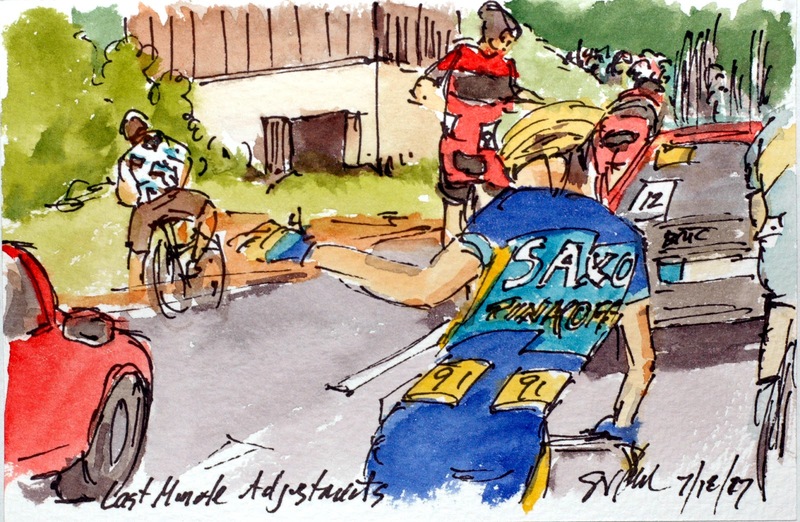 At the top of the Col du Madeleine Rolland slipped away from Hesjedal to get the maximum points towards the King of the Mountains competition. After going over the top, he reached back to thank Ryder for not challenging him for the points, they probably made a deal to work together to stay out in the lead all the way to the finishing town. This is an original watercolor and ink postcard that is available for purchase at my artist website. Just follow the direct link at the end of this post to get your piece of the 100th Tour de France. With all of the technology in the Tour, from carbon fiber bikes to hydraulic brakes to electronic shifters it is somehow comforting to know that riders will grab newspapers to put in the front of their jerseys for the ride down the mountain. They do this to keep warm, having sweated on the ride up, they need to block the wind from cooling them down too much. This was one of the first times I have seen a team helper standing at the top of a climb handing out papers, they usually are passing water bottles. This is an original watercolor and ink postcard that is available for purchase at my artist website. Just follow the direct link at the end of this post to get your piece of the 100th Tour de France. With the peloton willing to take it as easy as possible it was a good day to be in a break away, plus everyone who was allowed to go were at least 45 minutes back of the Malliot Jaune. These two, Hesjedal and Izaguirre, are out in front of another group of forty other riders. Ryder Hesjedal, who won the 2012 Giro d'Italia, has been having a rough Tour since cracking a rib early on in this year's race. I'll let that sink in for a minute... He has been riding in the toughest race in the world for 16 stages with a broken rib! And now, he is attacking on a 5 categorized climb stage after a stage that climbed the fabled Alpe d'Huez, twice. This is an original watercolor and ink postcard that was created using cake watercolors, brushes and paper from www.richesonart.com In addition this work is available for purchase at my artist website. Just follow the direct link at the end of this post to get your piece of art of the 100th Tour de France. I am trusting Google to correctly translate, "On Top of the World", I know a little bit of French so I feel good about "du Monde". But I am sure I feel no where near as good as Christophe Riblon who had been in the first break that got away at 17 kilometers. To have the opportunity and ability to grab the coveted win atop the Alpe d'Huez and the long sought after win for the home team, moved him to tears of joy and fist pumbs of jubilation. It should be noted that the last time the Tour climbed the storied Alpe, it was another Frenchman who crossed the line first, Pierre Rolland. This is an original watercolor and ink postcard that is available for purchase at my artist website. 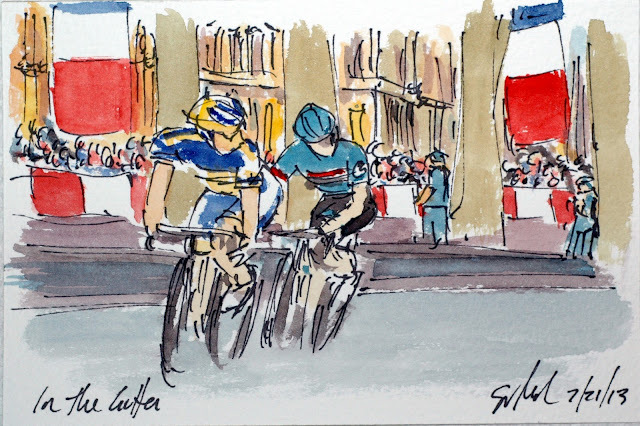 Just follow the direct link at the end of this post to get your piece of the 100th Tour de France and the first victory for France. 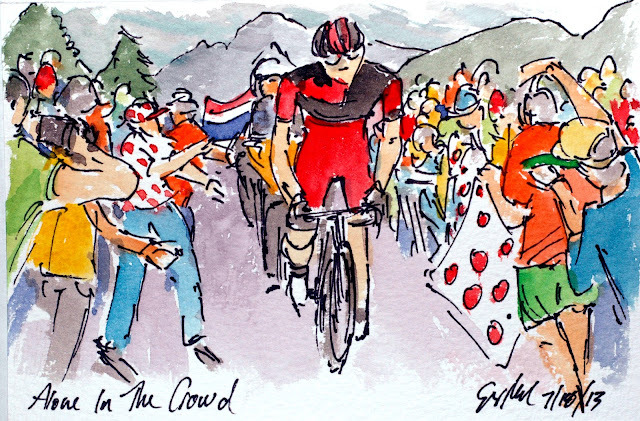 As in the first trip up Alpe d'Huez, Riblon was dropped by Van Garderen on the steeper parts of the climb, but I think he found comfort in knowing that he had got the BMC man at the top on the first climb and was confident that he could repeat that feet. 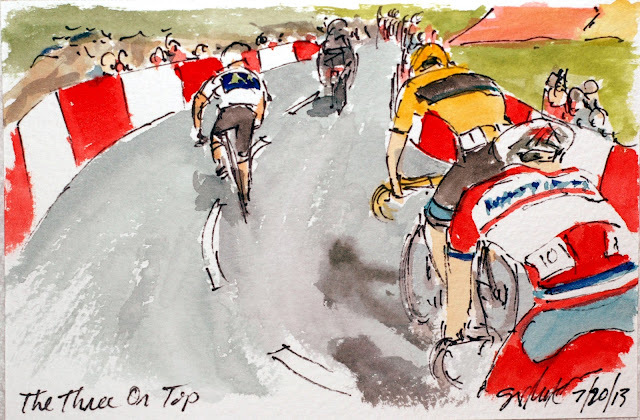 Riding with the hopes of every Frenchman along the road and throughout the country he did catch TeJay just before the red kite of one K to go. Buoyed by the dreams of his country winning a stage in their 100th Tour of their homeland, he jumped right by his adversary and rode the air of French faith to the top of the mountain. He was aware enough to tell his team director to move so he could take the inside corner of the coming turn. France now has their first victory in the 100th Tour de France, the USA is still looking for theirs. And for the record, AG2R is a French team as well. This is an original watercolor and ink postcard that can be yours by visiting my artist website where you can purchase this painting. Just follow the direct link at the end of this post to get your art of the 100th Tour de France. I truly have no idea what this conversation actually was. No idea at all, but the rumor mill claims that Froome offered the first Alpine stage to Quintana if he could hang on his wheel, he couldn't and Froome took the stage. Today, it looked like Quintana wasn't listening to him, but then his face rarely shows anything, except for joy when pulling on the White Jersey. Rodriquez just matched the two wondering why he wasn't included in Froome's touchy feely behavior. Quintana obviously wasn't interested in any gifts today. This is an original watercolor and ink postcard that can be yours by visiting my artist website where you can purchase this painting. Just follow the direct link at the end of this post to get your piece of the 100th Tour de France. I enjoy the inclusion of the "Children at Play" sign behind the group of three. Every rider either climbed the Alpe d'Huez a second time today or they abandoned the race, two took the second option. With the remainder of the earlier break scattered up the road Chris Froome weathered all of the GC attacks and dished out his shared of his own. At this point the only two who could match his attacks were the Colombian climber, Quintana, and the GC Spanish contender Rodriquez. Each of Froome's accelerations would drop his team mate, but failed to get rid of these two. However, he did managed to dispatch Contrador, Mollema, and Ten Dam. This is an original watercolor and ink postcard that is available for purchase at my artist website. 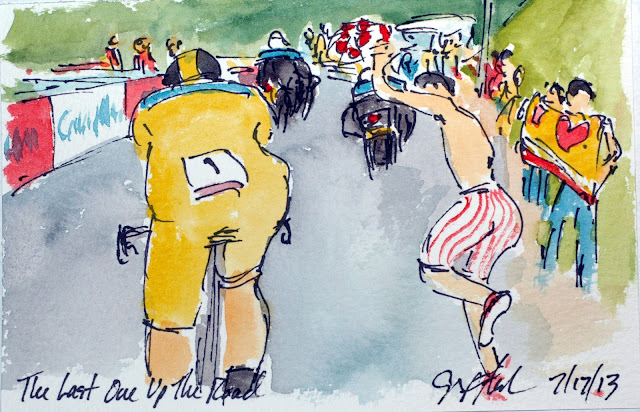 Just follow the direct link at the end of this post to get your piece of art from the 100th Tour de France. Oops, got these out of order. So this is before the watercolor, "Team Mates"
A long time fixture along the side of every stage of the Tour for as long as I have been watching (and that goes back several years pre-Armstrong) I have seen the devil jumping up and down, waving his pitchfork clad all in red with a black cape. Obviously, he has had a costume change for the 100th Tour de France, wrapped in brilliant yellow, his long white hair flapping, he still carries the same energy and enthusiasm as when I first saw him so many years ago. Given the hellacious second climb of the Alpe d'Huez Riblon and Van Garderen already knew they were in hell, the devil just confirmed it. This is an original watercolor and ink postcard that can be yours in a short 3 day auction on ebay. Just follow the direct link at the end of this post to get your piece of the 100th Tour de France. Chris Froome was an invaluable teammate to Bradley Wiggins in the 2012 Tour, burying himself in service of his team leader, Froome has been paid back in spades in the form of Richie Porte. Today Porte was dropped by either their rivals accelerations or from Froome himself several times and each time, he would recover and ride back up to his friend and team leader to work as hard as he could for the team and the Jersey. Froome was moved when Porte showed up at his side yet again, putting his arm around his shoulder and telling him what I can only assume was his deepest gratitude. This is an original watercolor and ink postcard that can be yours by visiting my artist website. While you are there, why not browse all of the art on offer? Just follow the direct link at the end of this post to get your piece of the 100th Tour de France. 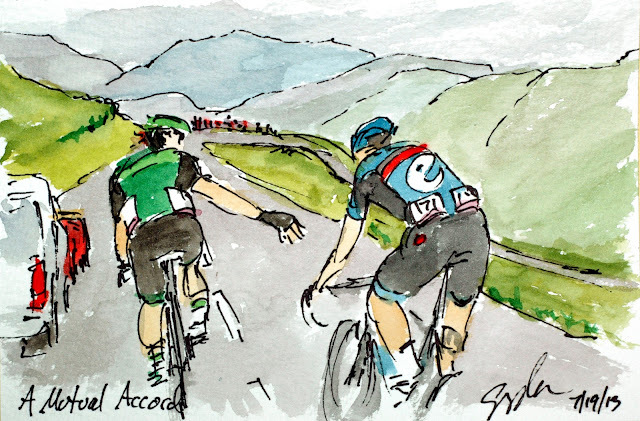 Christophe Riblon, the French rider on the French team, managed to catch TeJay as they went over the top of the first the pass of Alpe d'Huez and then road together to cross the Col du Sarenne together. The crowds were kept off of this stretch of narrow road lined with fragile endangered flora, so while it was an important climb and dangerous descent, no spectators (other than cyclists, officials and the Gendarme) were they to witness the battles in person. 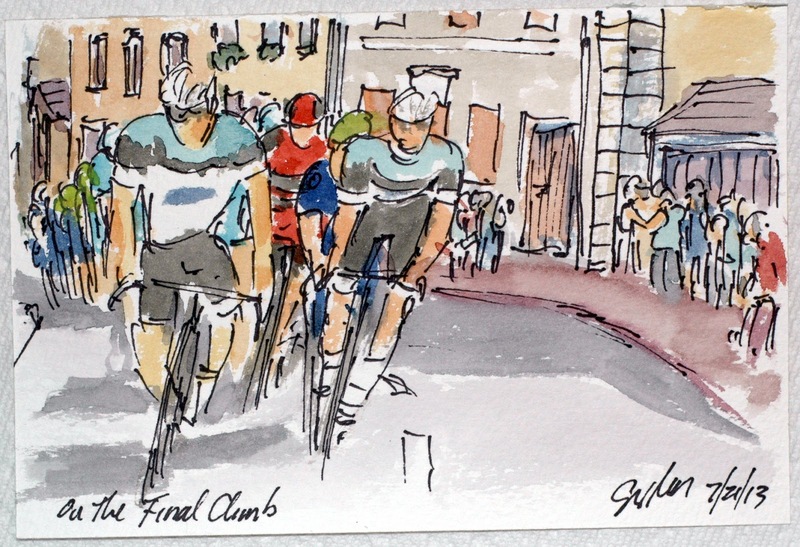 The peloton complained about the organizers using this narrow unprotected descent with steep drop offs on most every corner. Both of these guys had trouble on the way down, neither was serious, but had them both expending more energy they would have preferred. This is an original watercolor and ink postcard that can be yours by visiting my artist website to purchase this painting. Just follow the direct link at the end of this post to get your art of the 100th Tour de France. TeJay showed in the time trial that he was back on form after a very disappointing Tour for the first two weeks of the race. He carried the form of yesterday forward into the arguably toughest stage of the 100th Tour de France, leaving his break away companions behind on the first assay of the Alpe. 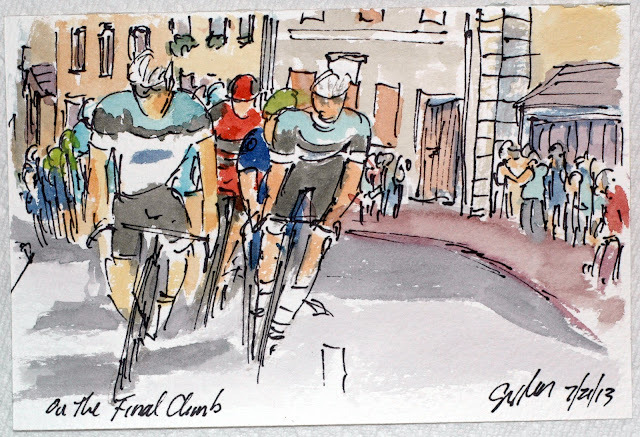 Every inch of the climb was lined with sometimes overly enthusiastic fans waving flags, snapping pictures and then there were the nuts that ran with the riders endangering the hard working men as they struggled up this daunting climb. This is an original watercolor and ink postcard that can be yours by visiting my artist website to purchase this painting. Just follow the direct link at the end of this post to get your art of the 100th Tour de France. Showing no fear of the fabled 21 switchbacks, this group of five road off from the others in search of the top of a stage victory or maybe just a head start up the mountain ahead of the peloton. The group includes, Christophe Riblon, TeJay Van Garderen, Lars Boom, Moreno Moser and Sylvain Chavanel, most of these guys have been in the lion share of the breaks in the 100th Tour de France. Even though the organizers had closed the roads for three days prior to the peloton's arrival, their were tens of thousands of pro-cycling fans lining every kilometer of the ever climbing road, and they knew they were going to see every rider pedal by them twice. This is an original watercolor and ink postcard that can be yours by visiting my artist website. While you are there why not browse around at all of the artwork on offer. 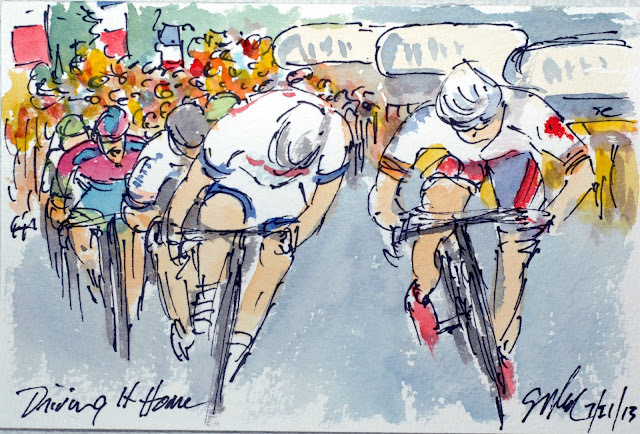 Just follow the direct link at the end of this post to get your piece of art of the 100th Tour de France. The peloton seemed to be afraid of Alpe d'Huez or at least climbing it twice, so were not worried about a break where the highest placed rider, Sylvain Chavanel was over 25 minutes behind the Yellow Jersey. 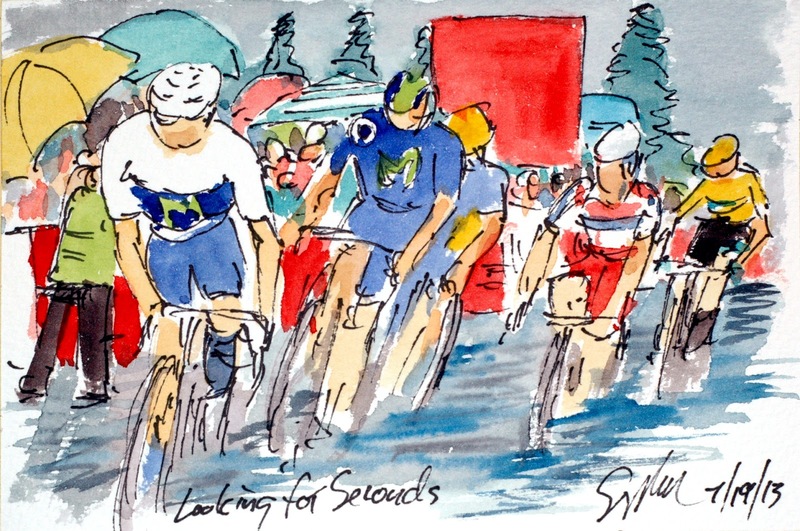 Many of the break away artists had counted on the peloton's sentiment and were ready to go out on the attack. The group quickly got up to six minutes on the way up the Col d'Ornon ahead of the big beast of the day. This is an original watercolor and ink postcard that can be yours by visiting my artist website to buy this painting. Just follow the direct link at the end of this post to get your piece of the 100th Tour de France. With the peloton underway after the dropping of the flag, the nervous riders fiddled with brake adustments, extra drinks and energy gels and a quick "nature break" along the side of the road. 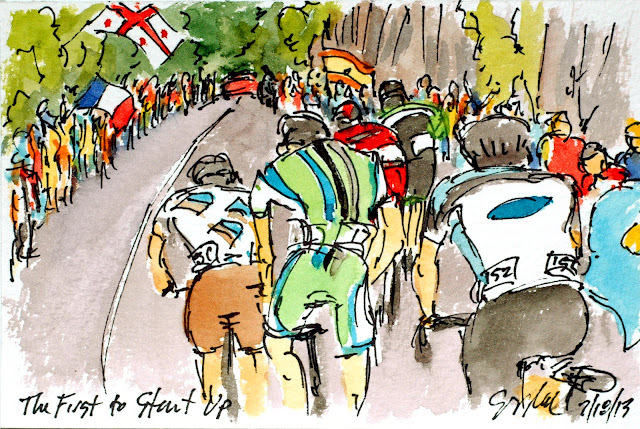 The peloton game out swinging on the very first climb of the day like they were eager to get the day over and done. A "nature break" is code for peeing along the side of the road, remember these guys are on the saddle for 4 to 6 hours a day and they need to drink incredible amounts of water to prevent getting dehydrated or cramps. This is an original watercolor and ink postcard that is available for purchase at my artist website. Just follow the direct link at the end of this post to get your piece of the 100th Tour de France. The peloton lined up for the start today knowing that they were going to suffer mightily in the coming stage. The Tour has climbed the Alpe d'Huez before, it has even done it twice during one running of the Tour, but it has never done what the peloton will be doing today. The warriors of two wheels will be making the fabled climb of 21 switchbacks twice in one stage finishing on the top of the queen of the Alps. I can only imagine what this group was feeling before they got underway. This is an original watercolor and ink postcard that was created using cake watercolors, brushes and paper from www.richesonart.com In addition, this work is available for purchase at my artist website. Just follow the direct link at the end of this post to get your piece of the 100th Tour de France. Bauke Mollema just wasn't having a good day first, he was losing time against Kreuziger and Contrador (both behind him in GC) and then he ran out of road in the last hard turn on the course. He never hit the deck (something Peraud wasn't able to do, twice) but the tangle with the barrier slowed his race against the clock even further. Peraud, who had been the best placed Frenchman in the Tour, had crash will riding the course in training fracturing his collar bone. During the stage he went down hard on the same shoulder in this corner, ending his Tour de France with just four more days to the L'Arc de Triomphe. This is an original watercolor and ink postcard that is available for purchase at my artist website. Just follow the direct link at the end of this post to get your piece of the 100th Tour de France. 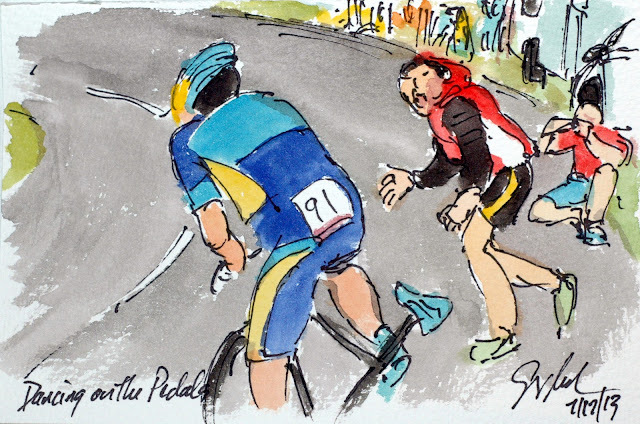 Alberto Contador has a very distinctive style on a climb, he rarely sits on the saddle and seems to dance on the pedals as he slides up the hill. It was this ability to dance away from his competitors that one him three Tours (although one was taken away from a positive doping control during the Tour). This year's Tour shows him unable to lose some of the contendors, most notably Neive, Quintana and Froome. Again, the fans love to run along side their heroes, cheering them on in a full throated cry, the calmer ones just take photographs. This is an original watercolor and ink postcard that is available for purchase at my artist website. Just follow the direct link at the end of this post to get your piece of the 100th Tour de France. Nairo Quintana was again in his element, climbing up step mountains at incredibly fast speeds, and used this to try and strengthen his hold on the White Jersey of the best young rider. In the end he lost about 10 seconds of his 4 minute lead over Michal Kwiatkowski, but solidified his standing in the overall GC. Traditionally, Columbian and Spanish cyclists have not done well in time trials, today they held 2nd through 5th in the stage placings. This is an original watercolor and ink postcard and is available for purchase at my artist website. Just follow the direct link at the end of this post to get your piece of art of the 100th Tour de France. The time trial is raced in reverse order of the rider's position in the over all time classification, so the Lanterne Rouge (the rider with the highest cumulative time) goes first, and then in descending order until the Yellow Jersey (the rider with the lowest cumulative time) is the last to leave the start gate, the last on the road. 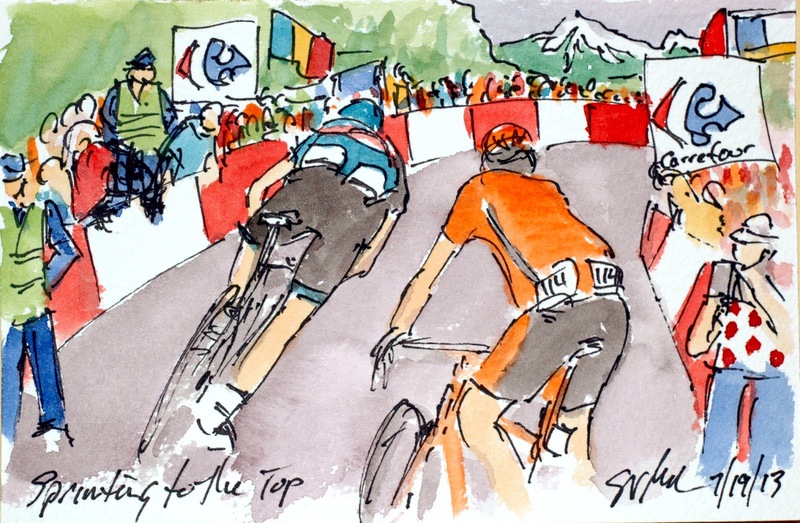 Chris Froome has that honor earned by brilliant rides in the mountains, and on every other stage in the Tour. Unlike most professional sports, cycling is the only one that is open and free to the general public, with fans able to get very (sometimes, too) close to the athletes. 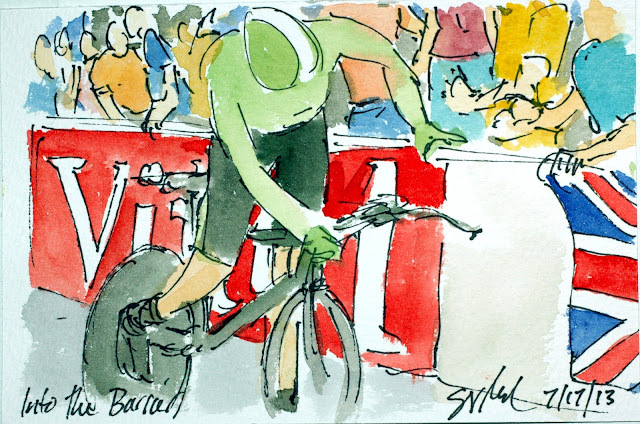 A favorite for sober and intoxicated fans is to run along side the riders yelling their encouragement and sometimes their abuse. Froome further insured is overall victory by winning this time trial, leaving his rivals scratching their heads on how they can possibly take the Malliot Jaune away. This is an original watercolor and ink postcard that is available for purchase at my artist website. 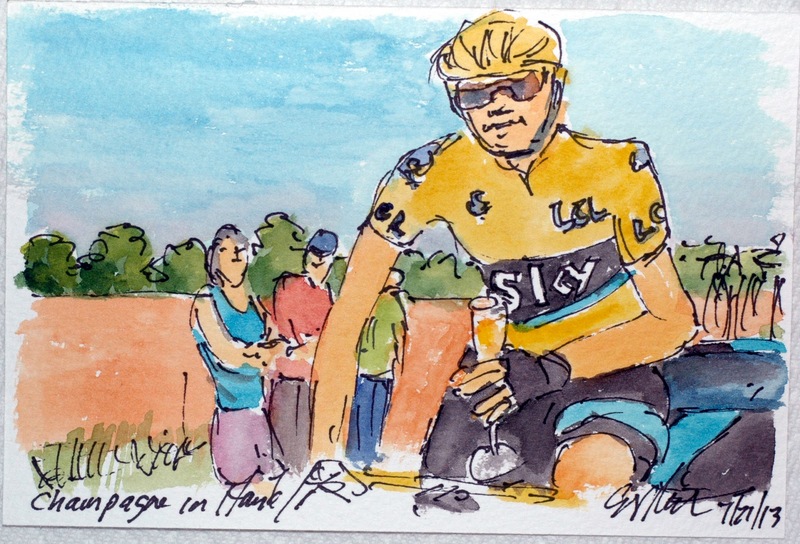 Just follow the direct link at the end of this post to get your piece of art of the 100th Tour de France. A time trial is all about speed, saving seconds where ever possible. It is the organizers practice to hold the racer's bike upright as they await the count down to the start of the timing clock. Being held upright allows the rider to clip into his pedals prior to the start of the clock, thus making the first and every other pedal stroke be about moving the bike forward. This is the young American, Andrew Talansky, the best place American cyclist in the Tour. He just edged out his countryman, TeJay but was quickly surpassed by the charging Spaniards and Columbian. This is an original watercolor and ink postcard that is available for purchase at my artist website. 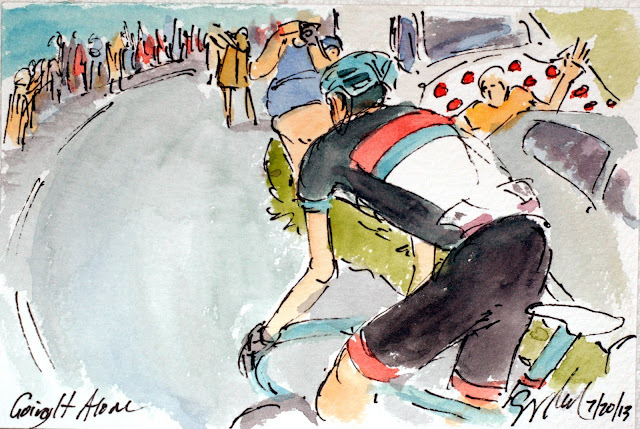 Just follow the direct link at the end of this post to get your piece of art of the 100th Tour de France. 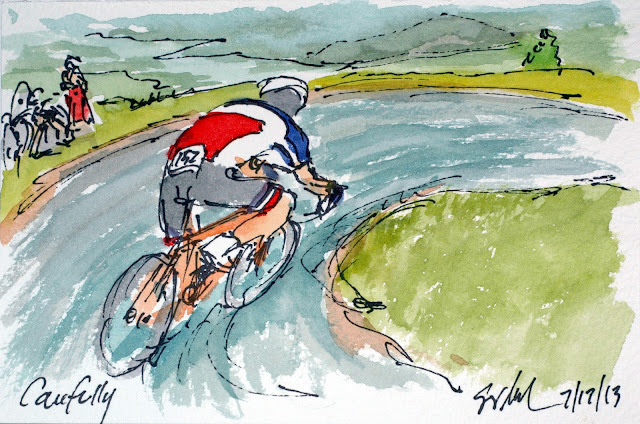 Sylvain Chavanel, the five time French National Time Trial Champion, had the misfortune of being on one of the two descents when a little down pour dampened the roads making the corners treacherous. In two of the corners prior to this one he had his rear wheel slide out from under him, unlike others, he was able to keep himself upright and pretty much at speed. But he had to back off of his charge to the valley and the finish, and was unable to post a competitive time. This is an original watercolor and ink postcard that is available for purchase at my artist website. Just follow the direct link at the end of this post to get your piece of the 100th Tour de France. TeJay Van Garderen has been having a rather rough Tour de France, but was able to put in a great ride in the mountainous individual time trial. He started out slow and was able to post better and better times at the time checks crossing the finishing line in first place. Unfortunately with a time trial, each rider must wait until everyone has crossed the line to find out the final results. So after spending a long time in the throne of current stage leader, where they will sit until they are disposed by a faster time. This is an original watercolor and ink postcard that was created using cake watercolors, brushes and paper from www.richesonart.com. In addition this work is available for purchase at my artist website. 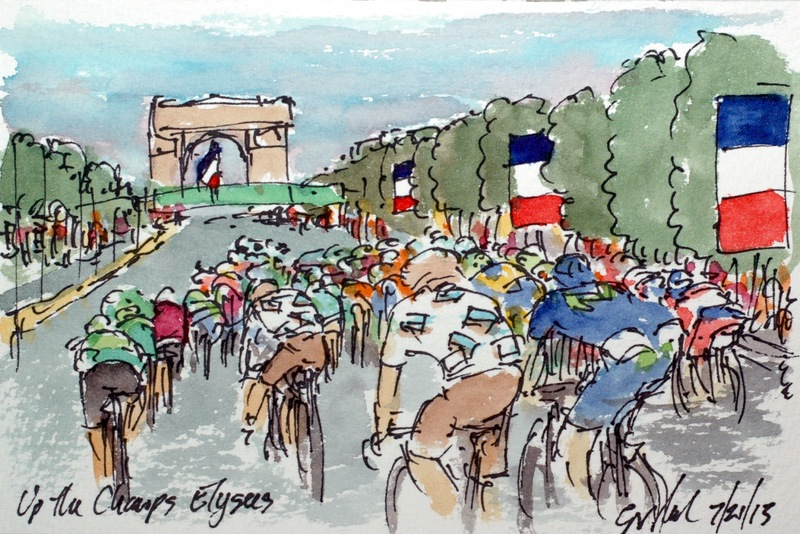 Just follow the direct link at the end of this post to get your piece of the 100th Tour de France. 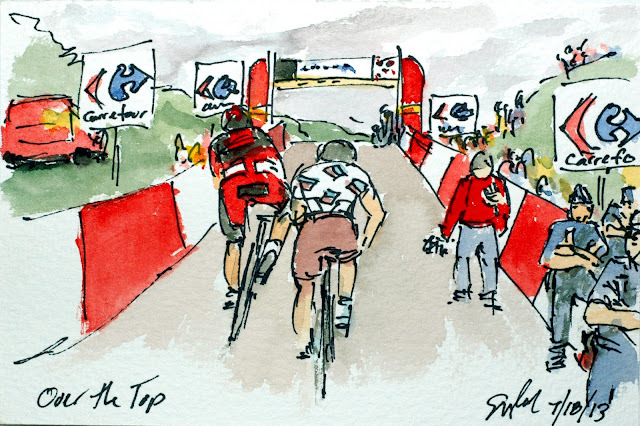 Tour Stage Sixteen: Want to Go? Tour Stage Fifteen: What Can We Do? Tour Stage Fifteen: Are They All Gone? 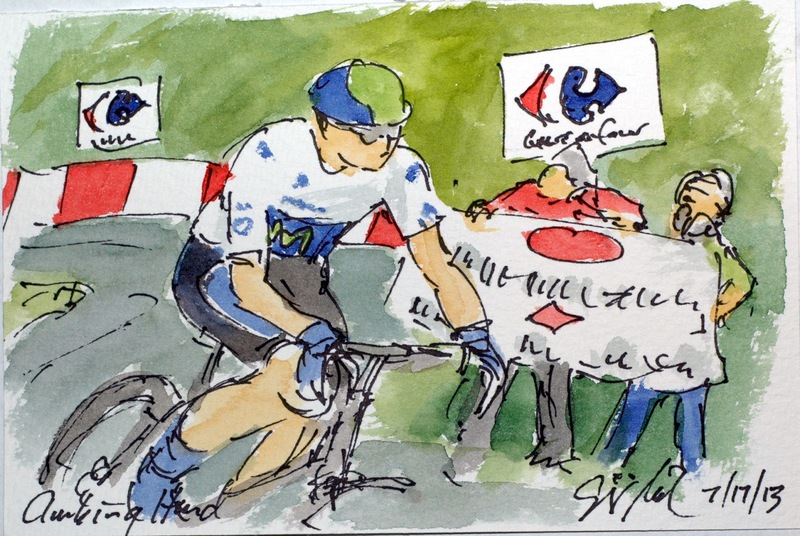 Tour Stage Thirteen: What Are You Thinking?